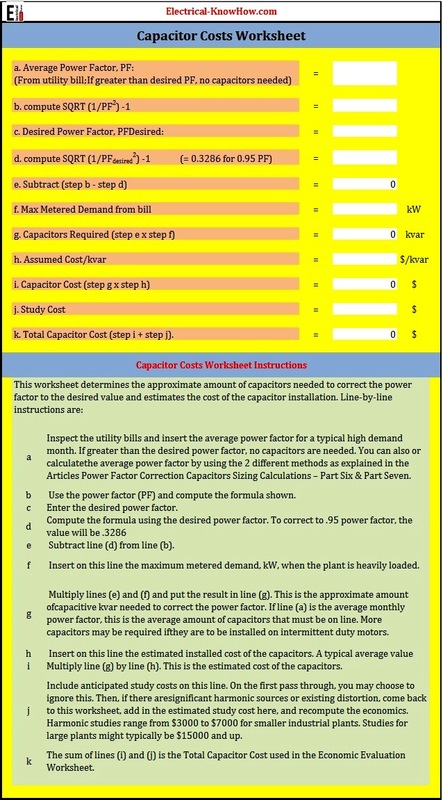 The worksheets assume that the capacitors will completely eliminate the monthly power factor penalty and that they will be distributed throughout the plant in such a manner that the maximum possible loss savings is achieved. 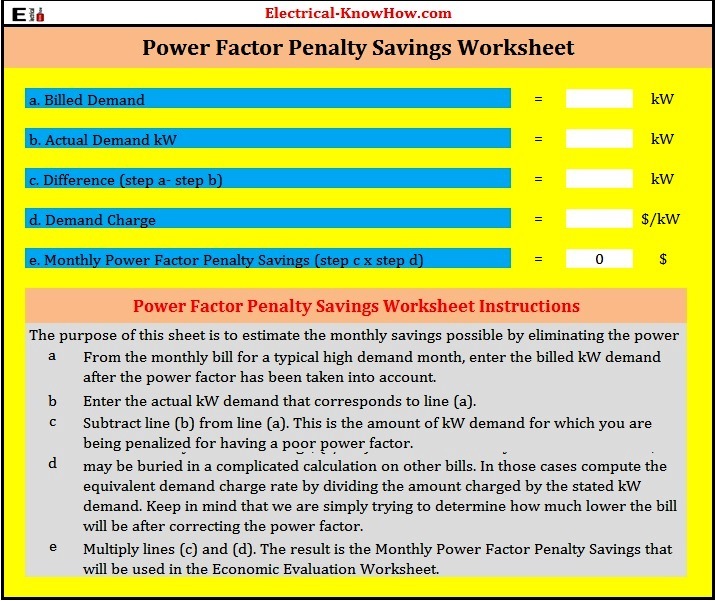 Then, using the desired time period and interest rate (selected by the purchaser), the annual power factor penalty savings and loss savings are converted to their equivalent present value for comparison with the capacitor installation cost. If it is economical, we will proceed to the design phase. If not, we can stop/abort the process or continue with the design phase knowing that the installed PFCC isn’t economical. 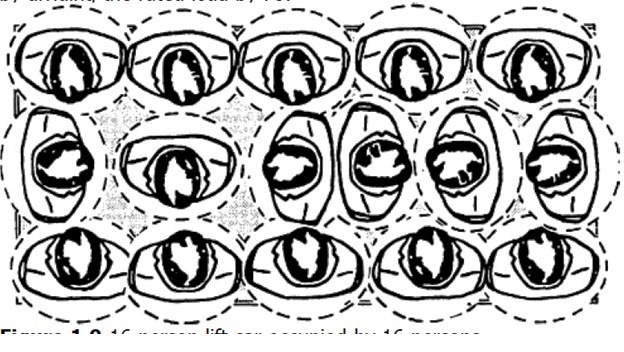 The Cover showing the name of the worksheet and its usage, see Fig.3. 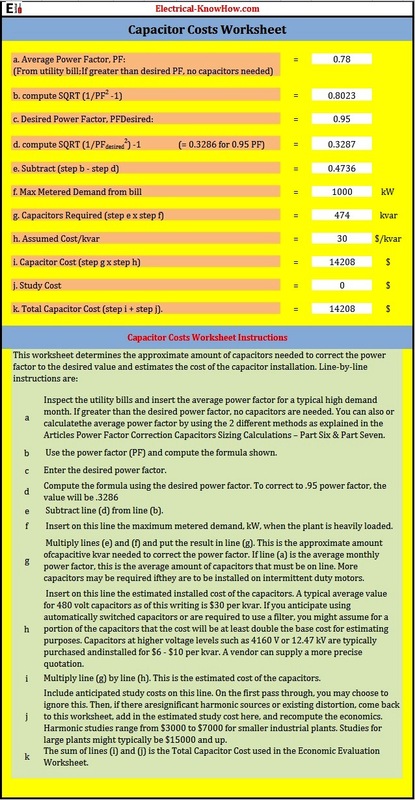 The Capacitor Costs Worksheet, which is used to Estimate Total Capacitor Cost, see Fig.4. The Loss Savings Worksheet, which is used Estimate loss savings, see Fig.5. 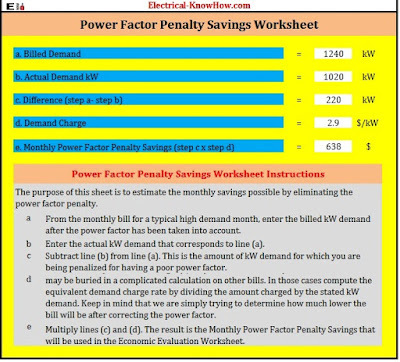 The Power Factor Penalty Savings Worksheet, which is used to Estimate power factor penalty savings, see Fig.6. The Economic Evaluation Worksheet, which is used to Evaluate economics and calculate the payback, present worth and benefit/cost. see Fig.7. Losses are estimated by summing estimates of the transformer and cable losses. Transformer losses are straightforward. The impedance can be determined from the nameplate and the current magnitude can be determined by measurements or existing panel meters. The cable losses are difficult to accurately quantify because cable sizes and lengths vary widely. The cable loss formula used in the worksheet is based on the empirical observation that with cable sizes and lengths typical of industrial systems, cable losses would be about 2% if all cables were operated near rated cable ampacity. Assuming that the cables were loaded to ampacity. Then the losses are referred to the total load that this current would yield. In both cases, the losses would have been approximately 2%. Thus, this was chosen as a round number for estimating purposes. Multiplying this by the square of the actual average per unit loading yields a number close to the actual losses. These assumptions make the estimated cable loss savings very approximate, but a more precise calculation would be too cumbersome for a hand calculation and require a detailed plant survey. The worksheet is designed to be used with data that can be obtained through relatively simple measurements. The percent loading of the cable is designed to be estimated from rms current measurements of the main feeder cables. The recommended procedure is to measure the average current flowing in several important cables and compare that to the ampacity of the cable. 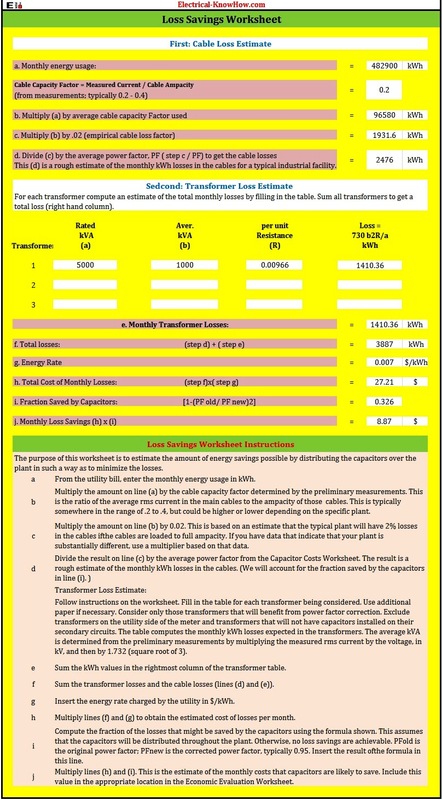 The ratio of average current to ampacity is entered into the Loss Savings Worksheet on line (b). Obviously, some cables will be more heavily loaded than others. The worksheet is intended to use an average loading level for the plant. It should be possible to make this judgment by determining the currents in a few of the main cables. 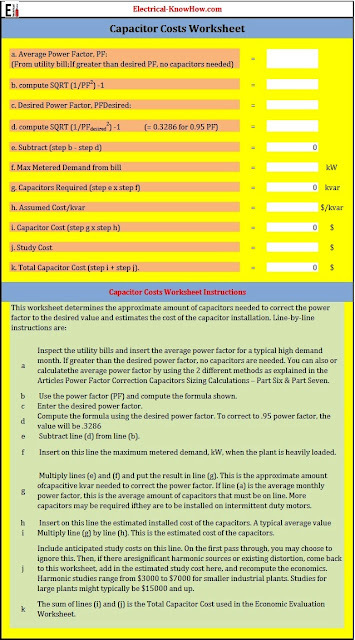 Again we will explain How to calculate the average power factor for an existing installation which will be needed in step a in the Capacitor Costs Worksheet. 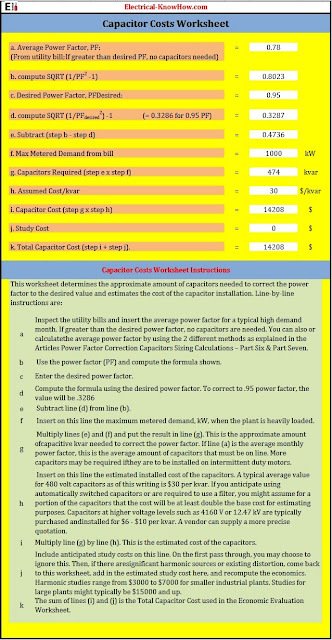 How to calculate the average power factor for an existing installation? 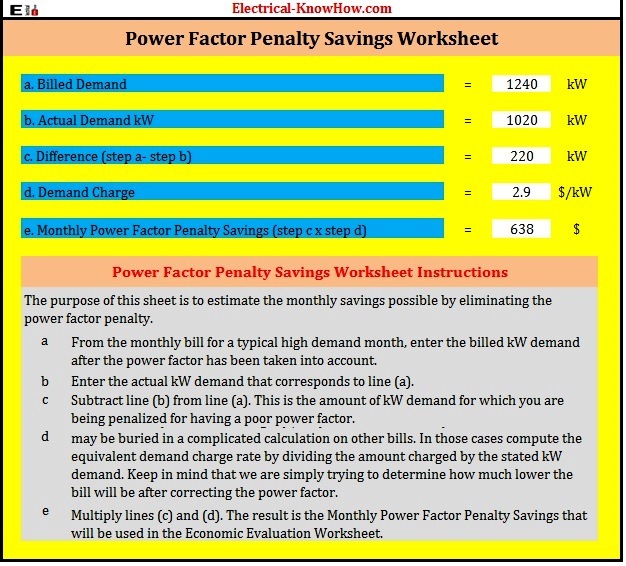 The power factor used in billing is generally an average power factor determined over the entire month, although a few utilities bill interval-by-interval. 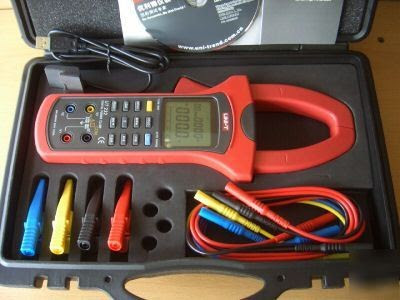 A clamp on power factor meter. Method#1: The kilo-var-hours (kvarh) meter as well as the kilo-watt-hours (kWh) meter. The kvarh meter is usually “detented” so that it only records lagging vars; that is, the vars drawn by motors. No credit is given for leading vars. Many utilities are now considering billing for kvarh similarly to kWh. Existing meter technology can separately track leading and lagging kvarh. This provides the opportunity to have flexible rate structures to create more incentives for industrial end users to control var consumption and production. 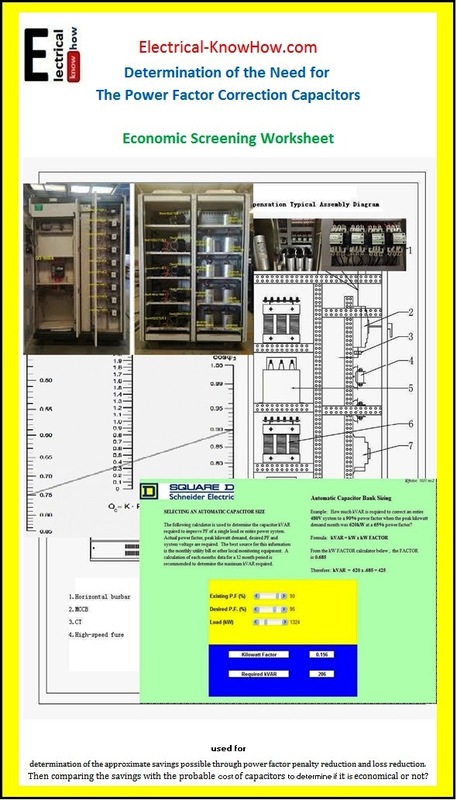 Since each load has its own power factor, the measurements should start with each individual machine and move upward to each distribution panel and finish at the feeder and then to transformer as shown in the Fig.8 below. Measuring power factor is a costly procedure when it is required to shut the load down and connect in a metering system to measure the current, voltage and power. So as to avoid the costly shutdown and time consuming measurement, it is preferable to use a clamp on power factor meter. 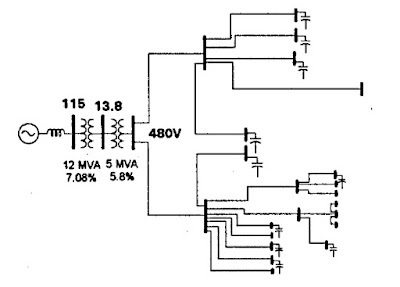 To connect the meter, the voltage leads are first connected to the meter and then clipped to the phases supplying the load. The clamp-on current transformer is then clamped on to the phase supplying the load. To select the appropriate clamp on CT, a conventional clamp tester is used to measure the load current. The voltage is also measured. Now using the clamp-on, power factor meter with appropriate CT, the power factor reading is noted. A food processing facility fed at 480 V through a primary-metered 5 MVA transformer. The facility consists of three main processes which run independently. The kW level at each plant does not vary significantly. Thus, the overall kW level tends to be relatively constant for extended periods of time, with significant changes occurring only when a plant is started up or shut down. The typical peak demand at present is 1000 kW, which is much less than the 5 MVA transformer capacity. The system originally had considerably more compressors than it currently does. Fig.9 shows a simplified one-line diagram of the facility. 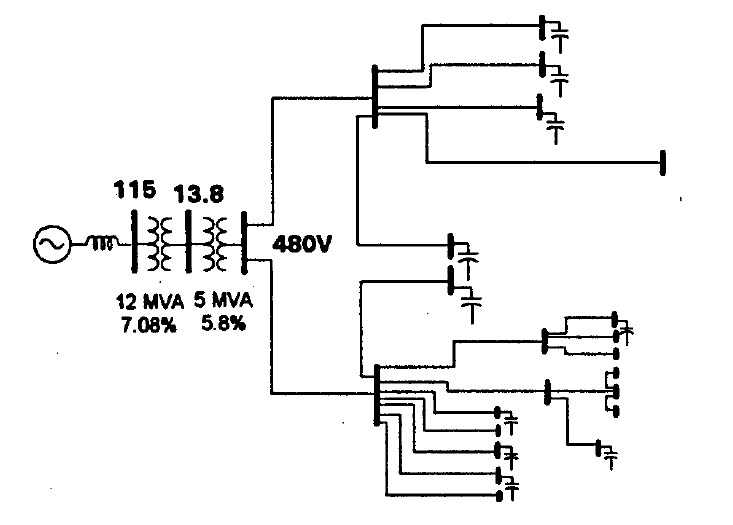 The capacitor locations selected are shown on the diagram. The average power factor was about 78% and the desired power factor is 0.95. The typical demand was approximately 1000 kW. Assumed Cost/kvar for fixed capacitors $30 per kvar. Billed demand 1240 KW and the actual demand 1020 KW from the bills. The billing schedule did not have a demand charge specifically identified, but an equivalent charge of approximately $2.90 per kW was derived from one of the bills by computing the bill assuming the power factor was corrected. The per unit resistance from the transformer nameplate is 0.00966. Note that the losses were evaluated at the marginal energy rate of $0,007 per kWh, which is the lowest rate at the highest level of energy usage. This is the proper value for evaluating the effect of loss reduction because the losses are subtracted out at the margin. The used fixed capacitors will be studied for 3 years and 7% interest rate. The worksheets indicate that a relatively simple fixed capacitor installation that costs approximately $30 per kvar should be quite economical based on a three year evaluation period and interest rate 7%. So, we can proceed to the design phase and The simple payback period is predicted to be about 1.8 years. 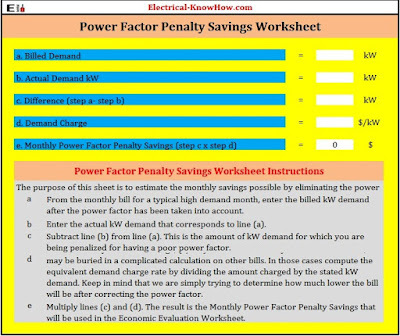 To download your copy of the Need for Power Factor Correction – Economic Screening Worksheet, please click on the link. 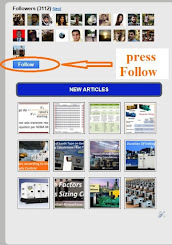 Click “Follow" in bottom of the home page, above the images of our members. In the next article, we will continue explaining other steps for Power Factor Correction Capacitors Sizing Calculations for Existing Installations. Please, keep following.